Group revenue declined by 3.7 percent compared with the previous year to EUR 2.18 bn. The predicted challenging market environment for standard viscose, plus less favorable exchange rates and a slight decline in sales volume were the key contributing factors. 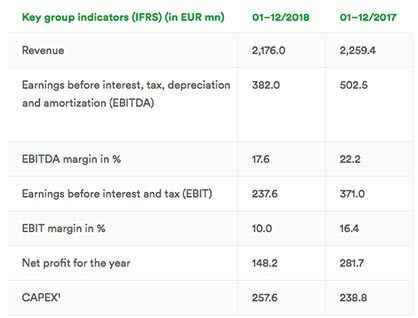 EBITDA (earnings before interest, tax, depreciation and amortization) was down by 24 percent to EUR 382 million due to price increases for key raw materials and higher energy and personnel costs. The EBITDA margin dropped from 22.2 percent in the 2017 financial year to 17.6 percent in the reporting year. EBIT (earnings before interest and tax) fell by 36 percent to EUR 237.6 mn, leading to a lower EBIT margin of 10.9 percent (2017: 16.4 percent). Net profit for the year after one-off effects dropped by 47.4 percent from EUR 281.7 mn in the previous year to EUR 148.2 mn. Earnings per share equaled EUR 5.61 (2017: EUR 10.47). The Management Board and the Supervisory Board will propose a stable dividend of EUR 3.00 per share plus a special dividend of EUR 2.00 per share at the upcoming Annual General Meeting. In total, the paid dividend will amount to EUR 5.00 per share, corresponding to a dividend payment to shareholders of roughly EUR 133 mn. “Although 2018 proofed to be more challenging than the preceding years, it was, nevertheless, the fourth best year in the company’s history. 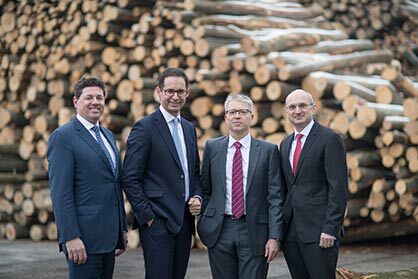 We consistently worked on the strategic imperatives of our sCore TEN corporate strategy in order to raise our pulp integration, enhance customer intimacy, increase the share of specialty fibers in revenue and to invest in new technologies and business areas”, says Stefan Doboczky, Chief Executive Officer of the Lenzing Group. “The very positive development of our specialty business in an expected challenging market environment for standard viscose confirms our strategic direction and our ambitious plans. Thanks to its specialty strategy and its strong brands based on innovation and sustainability, the Lenzing Group is significantly more resilient today than only a few years ago. However, we are not immune to global developments, and further efforts and investments in specialty fibers are required to become even more resistant to market fluctuations”, Doboczky adds. Adjusted equity increased by 1.7 percent to EUR 1.55 bn. The adjusted equity ratio decreased from 61.2 percent as at December 31, 2017 to 59 percent as at December 31, 2018. ROCE (return on capital employed) declined to 10.3 percent in 2018 (2017: 18.6 percent). Despite higher capital expenditures, net financial debt remained at a low level, totaling EUR 219.4 mn at the end of 2018 (December 31, 2017: EUR 66.8 mn). Capital expenditures (CAPEX) of the Lenzing Group continued to increase to EUR 257.6 mn in 2018 (2017: EUR 238.8 mn.). Trading working capital rose by 7.2 percent to EUR 444.4 mn and cash flow from operating activities increased by 3.3 percent to EUR 280 mn. Expenditures for research and development (R&D), calculated according to the Frascati method, amounted to EUR 42.8 mn in the 2018 financial year (2017: EUR 55.4 mn), putting Lenzing in the top ranks of the industry both in absolute terms as well as in relation to revenue. The textile and nonwoven industries are faced with fundamental ecological challenges, and as a leading producer of wood-based specialty fibers, the Lenzing Group bears a special responsibility. In 2018, the company decided to continue along its ambitious path and to invest roughly EUR 100 mn in sustainable manufacturing technologies and production facilities by 2022 in order to further strengthen its closed-loop model and support its customers in replacing resource-intensive and environmentally harmful solutions. With its most recent innovations, the Lenzing Group has taken important steps in this direction. After the presentation of the REFIBRA™ technology, LENZING™ ECOVERO™ branded high-performance and identifiable viscose fibers and TENCEL™ Luxe lyocell filament yarn, Lenzing announced the successful development of the LENZING™ Web Technology in 2018. This is a new technology platform with a focus on sustainable nonwoven products, which will open up new market opportunities for the industry. In a first step, 25 patent applications were filed. The Lenzing Group continued the implementation of its sCore TEN strategy in 2018. The start-up of new capacities for lyocell fibers in Heiligenkreuz, the production start of LENZING™ ECOVERO™ fibers at the Nanjing site, the acquisition of the remaining 30 percent of the Chinese subsidiary Lenzing (Nanjing) Fibers from the joint venture partner and the investment in another pilot plant for TENCEL™ Luxe filaments are important steps to achieve the goal of increasing the share of specialty fibers in total revenue. As a result of the decision to temporarily mothball the lyocell capacity expansion project in Mobile, Alabama (USA), in view of the buoyant labor market in the USA and the economic tensions between the major trading blocks, the implementation of the plan for specialty fiber growth will be slowed down. The Lenzing Group will adjust its growth plan accordingly in order to meet strong market demand for its lyocell fibers. This includes an increased focus on the lyocell expansion project in Prachinburi (Thailand). The planned production facility with a capacity of up to 100,000 tons will further strengthen the Lenzing Group’s global lyocell network. At the end of June, the Lenzing Group and Duratex, the largest producer of industrialized wood panels of the southern hemisphere, announced that they had agreed on the terms and conditions to form a joint venture to investigate building the largest single line dissolving wood pulp plant in the state of Minas Gerais (Brazil). This decision supports the self-supply with dissolving wood pulp and the growth in specialty fibers. The joint venture is investigating the construction of a 450,000 ton dissolving wood pulp plant, which is expected to become the largest and most competitive single line dissolving wood pulp plant in the world. The final investment decision to build the dissolving wood pulp plant is subject to the outcome of the basic engineering studies and the approval by the respective bodies. With the new positioning of its master brand and its product brands, the Lenzing Group started a new phase of branding and brand communication in 2018. Lenzing decided to carry out a new brand strategy to sharpen its corporate and product portfolio for consumers as a sustainable innovation leader and to support them in their purchasing decisions by creating a better understanding of the benefits of its products. In order to further intensify its cooperation with its customers and partners in the textile and nonwoven sectors, the Lenzing Group opened another innovation center at the Indonesian site in Purwakarta at the end of 2018. At the new Lenzing Center of Excellence the company conducts joint research and development work on new yarns with its customers and tests various types of fibers and yarns in special laboratory facilities. The International Monetary Fund expects a slowdown of global economic growth to 3.5 percent in 2019, mainly driven by increasing protectionist tendencies and growing geopolitical tensions. The currency environment in the regions relevant to Lenzing will remain volatile. Demand on the global fiber markets is still positive. According to preliminary calculations, cotton inventory levels should decline slightly again in 2019. Over the past months, the polyester market recovered from slower growth at the beginning of the reporting year. The price levels for cotton and polyester are expected to remain stable. Capacity expansions for standard viscose should remain at a similar level as in the 2018 financial year. Despite strong demand, this will result in growing oversupply, which will cause even higher pressure on prices. The Lenzing Group expects the positive development of its specialty fiber business to continue. Caustic soda prices in Asia have already declined significantly over the past months; however, there are no signs of such a development in Europe yet. Overall, Lenzing does not expect any significant changes for key raw materials that would be relevant to earnings. Based on the current exchange rates, the Lenzing Group expects its results for 2019 to reach a similar level as in 2018 despite a much tighter market environment for standard viscose. These developments reassure the Lenzing Group in its chosen corporate strategy sCore TEN. Lenzing is very well positioned in this market environment and will continue its consistent focus on growth with specialty fibers.